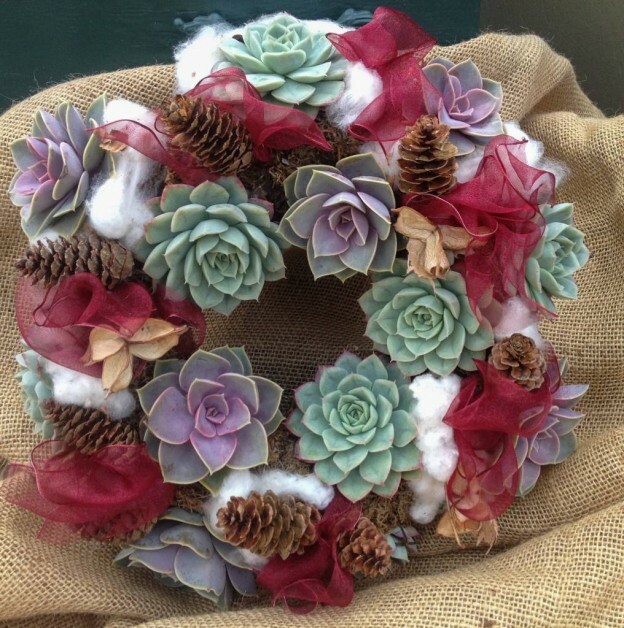 Succulent wreaths might not be what one thinks of first as a component of holiday decorating, but these pretty echeveria wreaths just might change your mind. The best thing about these wreaths is that there is room for the little echeverias to grow, and this also makes them easier to take care of through the winter months. The wreaths are just about 10″ in diameter and can just as easily be laid flat on a table and made part of a holiday tablescape as hung. Though they’re beautiful just as they are, adding other elements is easy to do. The one shown here was “dressed up” with small loops of a pretty, sheer ribbon, tiny pine cones, and small tufts of real cotton. The echeverias in these wreaths have been planted in a sphagnum moss wreath form and will continue to grow with the proper care. Give them as much direct light as possible, and, when the wreaths feel very light when lifted, it’s time to water. Place them in a shallow pan filled with a few inches of water and leave them in it for at least 30 minutes or until the form feels heavy, indicating it’s saturated. Do not water again until it feels very light once more. 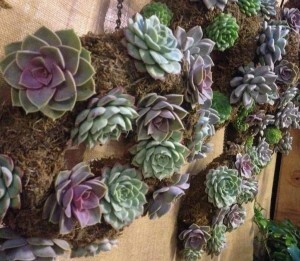 Remember, succulents prefer to be on the dry side. These sweet wreaths are in limited supply, so, if you’re interested in trying one, now is the time to stop in and take a look. 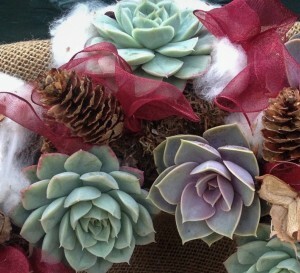 On their own or “dressed up”, what a lovely, unexpected, and long lasting addition to your holiday decor! 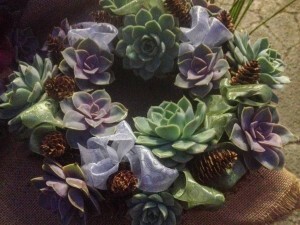 This entry was posted in Arrangements, Decorating, Gifts, Holiday, Succulents and tagged designing with succulents, echeveria wreath, holiday decorating, holiday succulent wreath, how to water a succulent wreath, seasonal plants, succulent wreath on November 18, 2014 by Kris Blevons.